SOUTH-EAST of New Orleans, where the Mississippi empties into the Gulf of Mexico, the North American land mass does not end so much as gently give up. 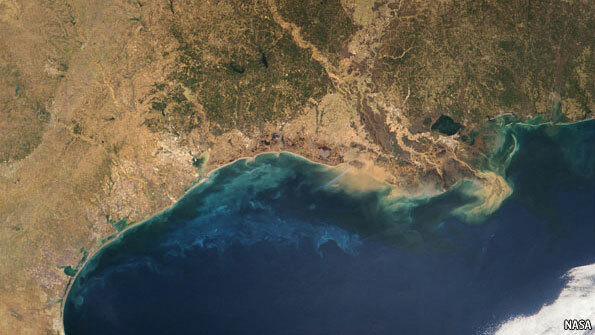 Land subsides to welts of green poking up through the water, and the river grows wider and flatter until it meets the ocean, where a solid line divides the Mississippi’s brown water from the gulf’s blue. On its long journey south the water has scooped up nutrients such as nitrogen and phosphorus, mainly from the fields of the Midwest. 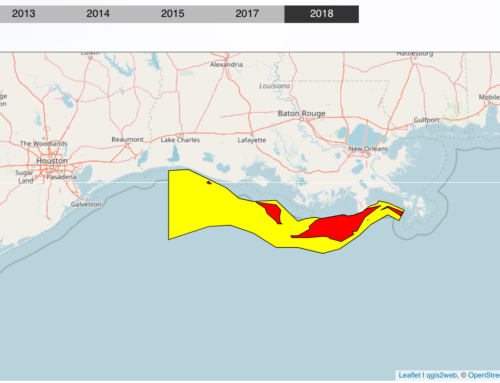 So much so that agriculture’s gift to the gulf is a “dead zone”. The excess nutrients cause algae to bloom, consuming all the available oxygen in the sea, making it hostile to other forms of marine life. Creatures that can swim away, such as shrimp and fish, do so; those that cannot, die. 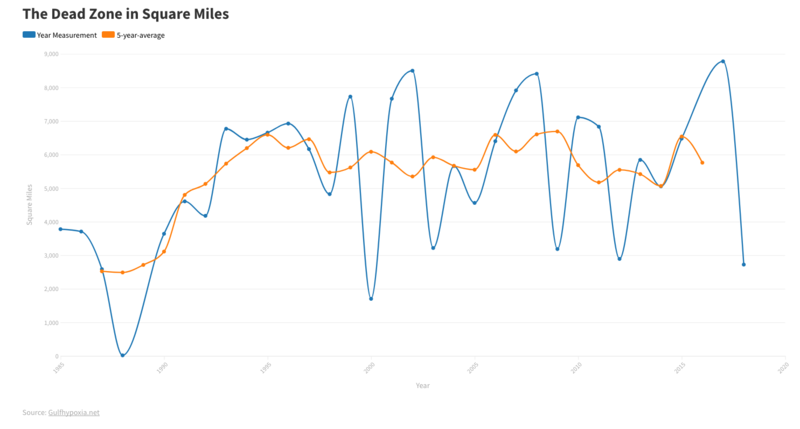 In the four decades since the dead zone was discovered it has grown steadily. Today it covers 6,700 square miles, an area larger than Connecticut. This ecological disaster area imperils the region’s commercial and recreational fisheries, worth around $2.8 billion a year. 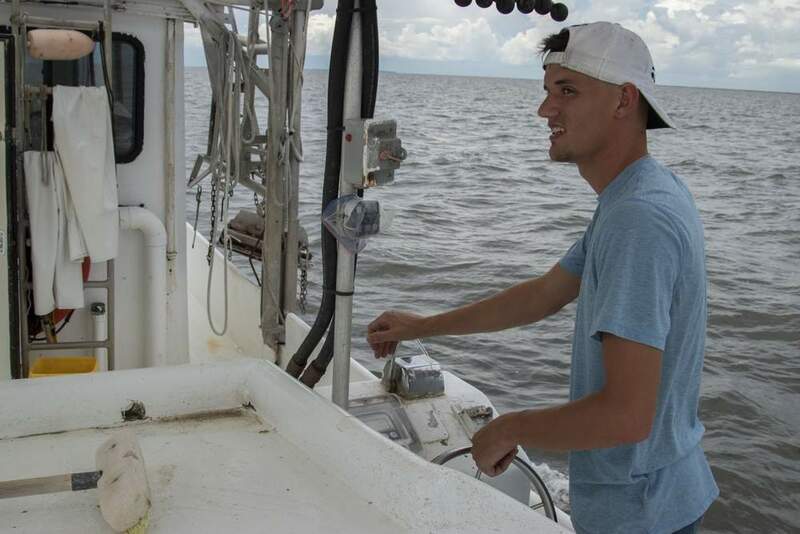 One study suggests yearly shrimp-fishery losses of nearly 13%. 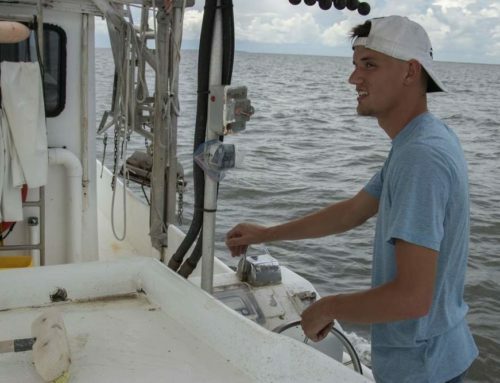 The dead zone drives shrimp farther out to sea, making it costlier and more time-consuming to catch them. It also makes them smaller. 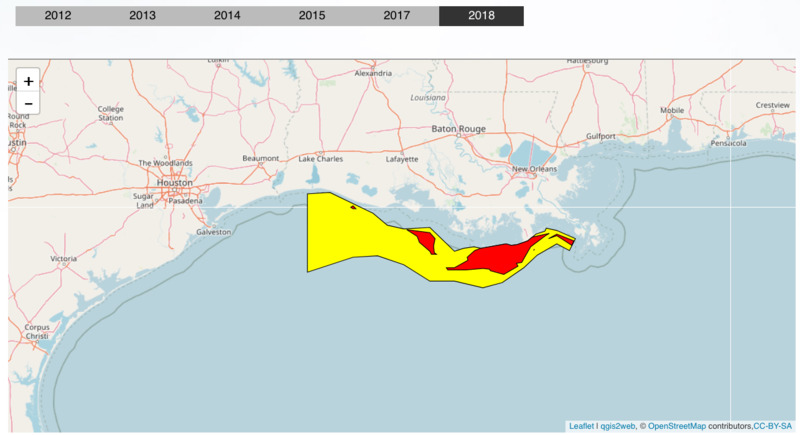 Nancy Rabalais, who heads the Louisiana Universities Marine Consortium and has mapped the dead zone each year for nearly three decades, claims that the amount of nitrates flowing into the Gulf of Mexico has increased by up to 300% over that time. Most of this comes from agriculture in the “I”-states (Illinois, Iowa and Indiana) and some from the city of Chicago. It would be a mistake, though, to think that the problem is confined to the Gulf. The effects of nutrient pollution are increasingly apparent throughout the Mississippi River basin. Environmentalists say that half the streams in the upper Mississippi have too much nitrogen and a quarter have too much phosphorus. This nutrient enrichment damages aquatic life there too, and degrades drinking water. It also causes blooms of toxic algae that have closed beaches, made people ill and killed fish and pets. Nasty green lakes have also damaged tourism, property values and fisheries. 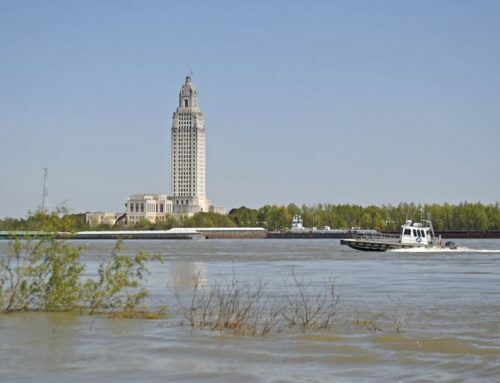 For years green groups have been trying to persuade the Environmental Protection Agency (EPA) to set a limit for the amount of nitrogen and phosphorus allowed in the states whose rivers feed the Mississippi. Little has happened. 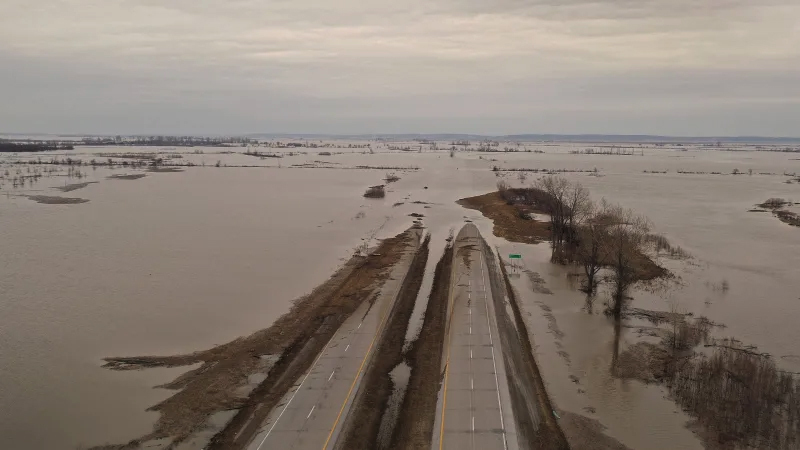 So in March members of the Mississippi River Collaborative, an environmental group, filed a lawsuit designed to force all those involved to think about ways to solve the problem. The EPA refuses to comment while the matter is in litigation. But the Federal Water Quality Coalition, a group composed of industrial and metropolitan water users, has launched its own lawsuit in opposition to the first. It argues that the federal government should play no role in setting limits, and furthermore that the very idea of limits is too simplistic. Yet it is not just green groups that think limits are helpful. Wisconsin is one of the few states to introduce, in 2010, statewide numerical limits for phosphorus. Joe Parisi, who runs Dane County, says these have spurred the county into working on new measures with the Madison metropolitan sewerage district. The idea is to experiment with projects that pay farmers to reduce nutrient pollution, using money that would otherwise have been spent on expensive technology for use by institutions such as municipal water authorities. One scheme is an innovative community biodigester that generates power from cattle manure. Another idea is a low-tech effort to extract phosphorus by using crops which are then harvested. Whatever the outcome of the nutrient-pollution lawsuits many people seem to believe that strict limits will come anyway, one way or another. One interesting pilot scheme being tried out in Minnesota allows farmers who reduce fertiliser run-off and soil erosion to enjoy an exemption from future state and federal water-quality standards. Elsewhere, the Electric Power Research Institute, an industry think-tank, is creating a programme that would allow the trading of nutrient credits between states. Its Ohio River basin water-quality trading project will allow those facing high pollution-control costs to buy reduction credits from those whose costs are lower. The first pilot trading will begin at the end of 2012, and again will allow those involved to use any credits against expected obligations in the future. If that project takes off it could become the world’s largest water-quality trading programme, spanning as many as eight states and allowing trading between 46 power plants, thousands of wastewater facilities and about 230,000 farmers. 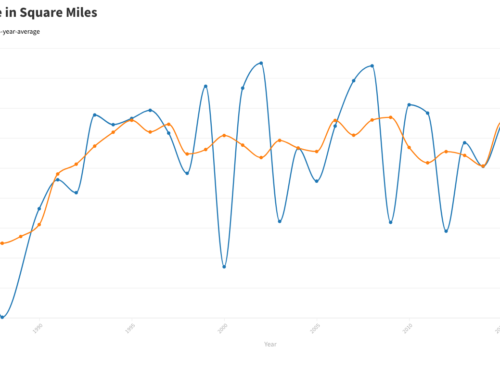 But those involved say numerical limits are needed to really push trading forward. If the upper Mississippi must await progress with limits, what hope is there further down the river? Along the lower Mississippi some have proposed diversions through wetlands as a way to mitigate oxygen starvation. 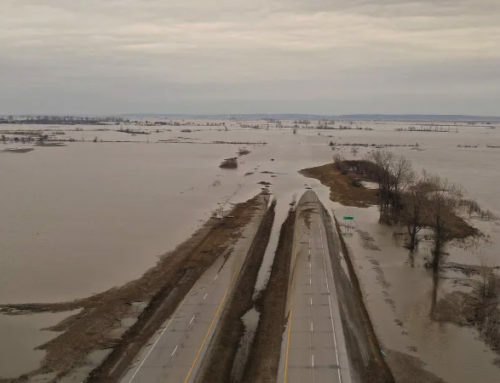 But a network of levees has held the Mississippi back for decades, so it is doubtful how much the river could feasibly be moved; the process of changing the course of America’s greatest river is more glacial than alluvial. Those Mississippi shrimpers had better cross their fingers and hope that the wheels of justice turn a bit faster.